Are you almost ready for the Supernatural 200th episode on Tuesday? 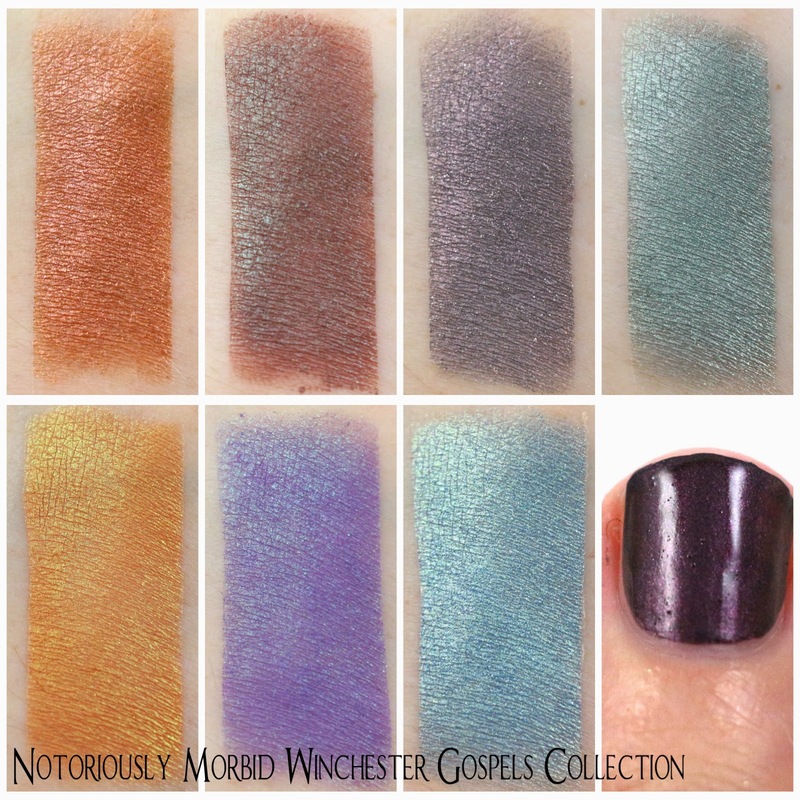 Get ready with Notoriously Morbid's Winchester Gospels collection! 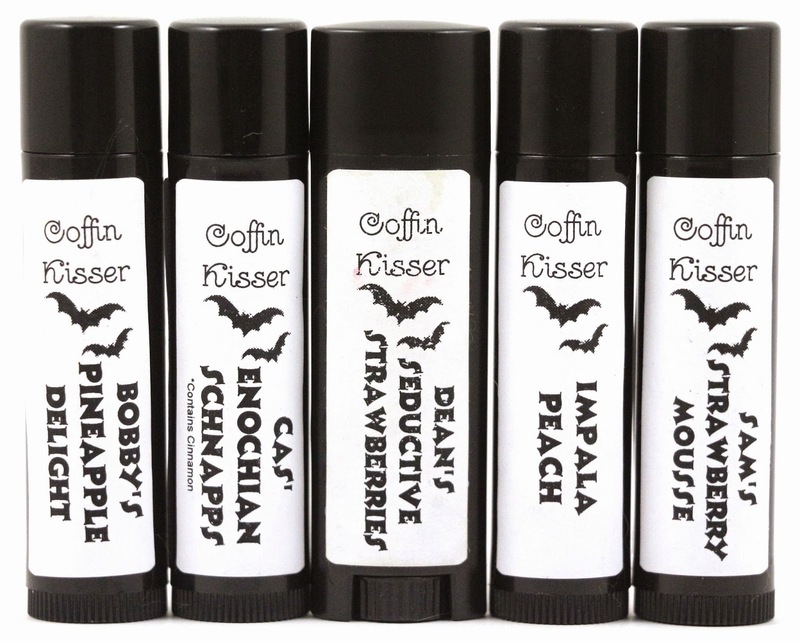 As an added bonus, I also have reviews for the Supernatural inspired Coffin Kisser lip balms. I'm a recent fan of Supernatural, but I powered through all 9 seasons on Netflix, and have caught up on the 10th season! I promise there will be no spoilers for this review. I did order the products in this review in two different orders, so I will try to give an overview of the customer service, shipping, etc. for both orders. Shipping - Notoriously Morbid's turnaround time has been slowly increasing over the past couple months, so my shipping experience may not be the same as yours. For the first order, the turnaround time was at 10-14 business days, and it shipped 14 days after I ordered, and arrived in 2 days via USPS from West Virginia to California. The second order had a stated turnaround time of 14-21 business days, but I did ask if there was any way to get it sooner since it did contain another item meant for Halloween. It shipped 12 business days later and arrived in 2 days via USPS from West Virginia to California. I will mention that I received tracking for these orders, but they didn't actually get picked up by USPS until as many as 5 days later, and I count when it "shipped" by when it gets scanned by USPS. Here is the entire collection, with the addition of the lip balms. The shadow names are all inspired by the songs of Supernatural, and the characters that best fit the songs. It's a great take on a Supernatural collection, as music is a very important part of the show. Product Size - Each shadow from this collection can be purchased in sample bag, mini jar, or full size jar form. The nail polish can be purchased in mini or full size form. And the Coffin Kissers are full size only. Free Samples - For the first order, I received 2 free eyeshadow samples. For the second, I received a sneak peak at one of the Black Friday shadows, and no other samples. 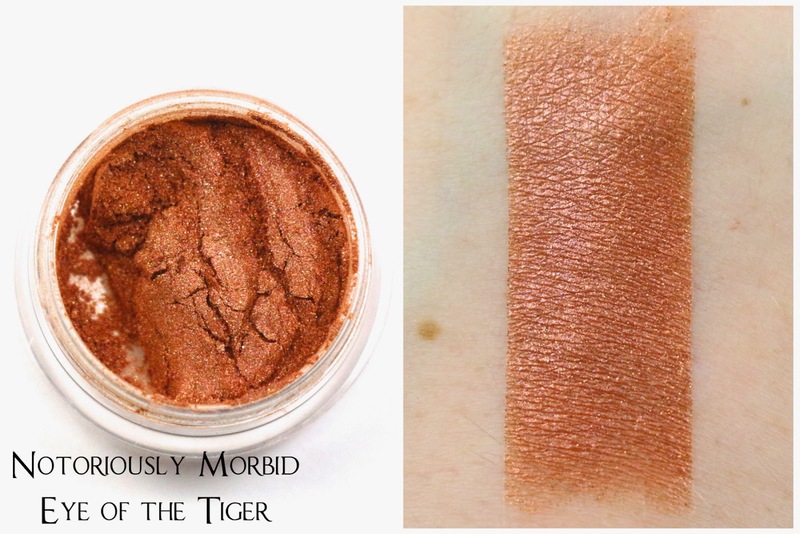 This definitely reminds me of the orange of a tiger, and you can see a bit of sheen to it. I think this would pair well with Visions or Hallelujah. It's probably my least favorite shade of the collection, just because I have so many oranges, and it's not a color I tend to reach for on a regular basis. I love that this color reminds me of a kind of combined color of Cas' outfit on the show. He usually wears a light brown trench coat, a dark suit, and a blue tie. 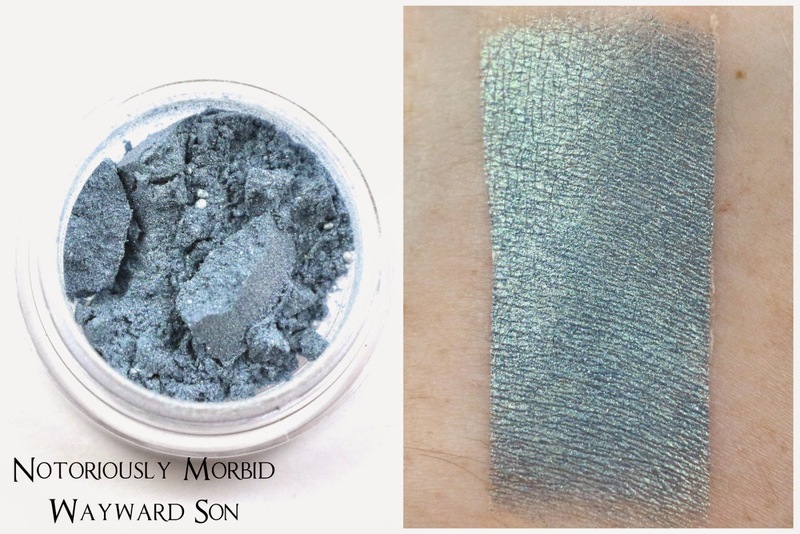 Really this is like the perfect shadow to evoke Cas, and I think it would pair well with any of the other shadows in the collection. 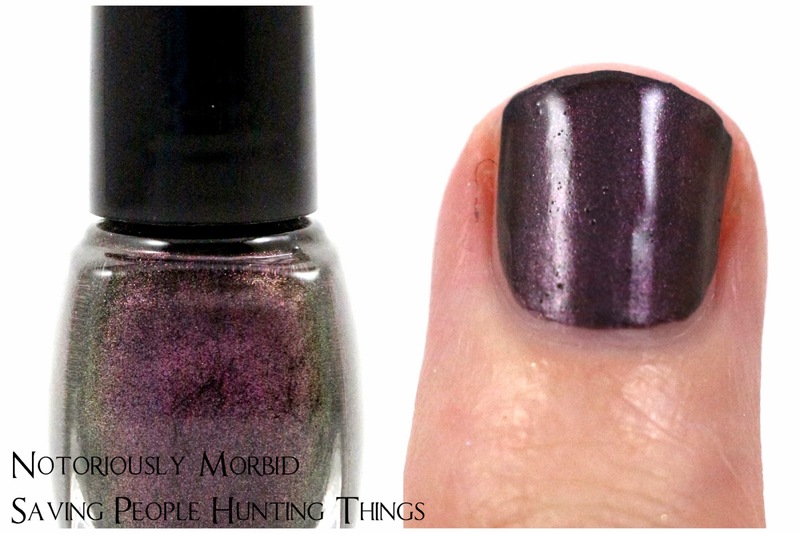 Saving People, Hunting Things - "An amethyst shimmer with a smoky black base." This was just a quick one coat swatch, no base or top coat, and you can see it is really opaque. It's actually so dark that the camera had a hard time getting the color right, so I adjusted it to get it as accurate as I could. In the bottle you can see some golden and green highlights or shimmer, but that does not get conveyed on the nail. 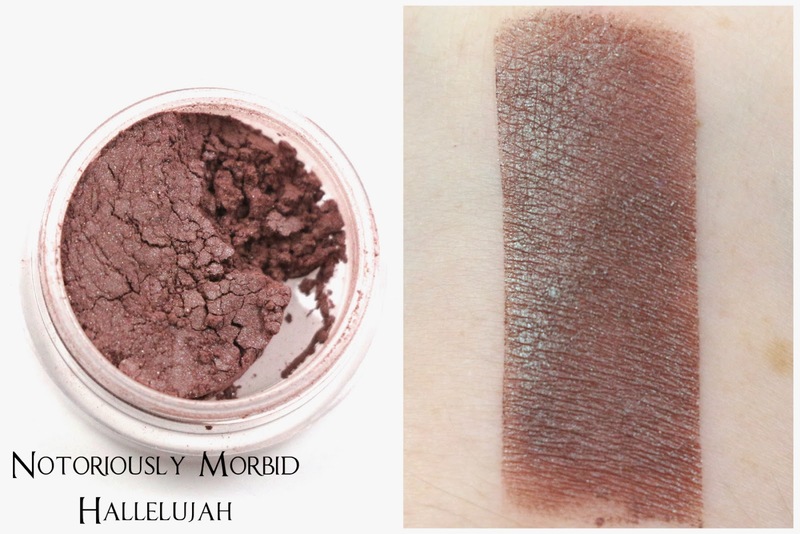 This shade reminds me of Crowley's tie he wears on the show, it's a dark gray color, and the shift in this shade definitely looks red to almost violet. 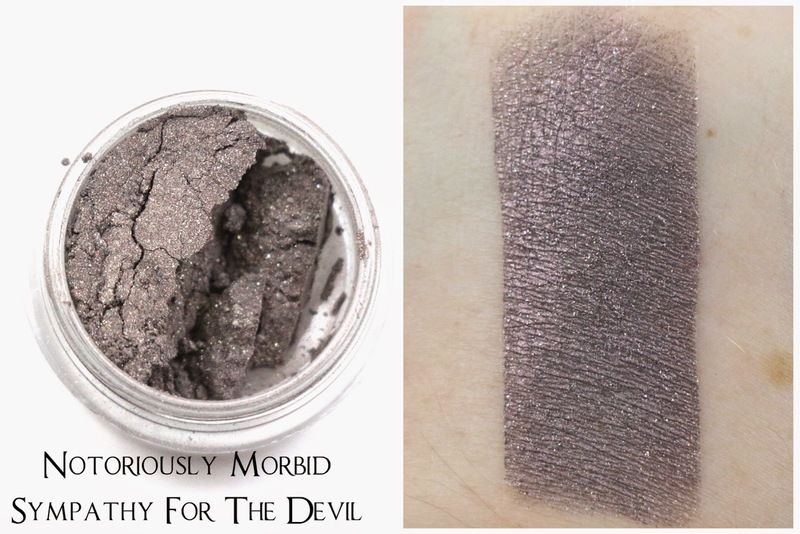 A great shade for The King of Hell. Bobby wears quite a few clothing items that are close to this green shade, and I love this shade. Sage green is a good name for it, and the sheen to it is really pretty. 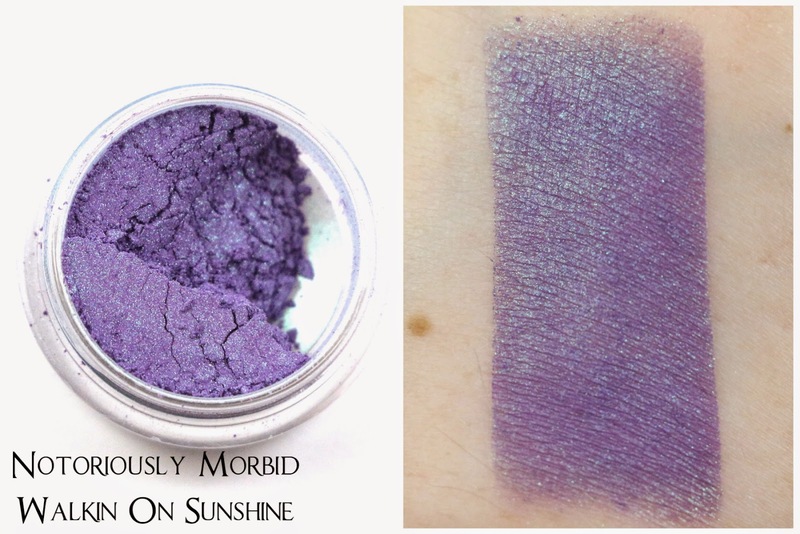 I almost think this shade should be the Walkin' On Sunshine shade instead, I was swatching it and wasn't looking at the name, and that's what I thought it was. The description is perfect though, the sheen was definitely an electric yellow, and it was really noticeable as well. This is a great shade for Charlie, the first time you meet her in the show, she's listening to this song, and is wearing an outfit that is this exact color. I would have loved for this to be the vibrant color of her hair instead, but that's mostly because I just have a fascination with red eyeshadows. I would describe this shade as more of an icy blue, with a silvery green shift, but it's definitely very pretty and would look great paired with Walkin' On Sunshine, or Hallelujah. These Supernatural inspired Coffin Kisser lip balms are not officially part of the Winchester Gospels collection, but are Supernatural themed. 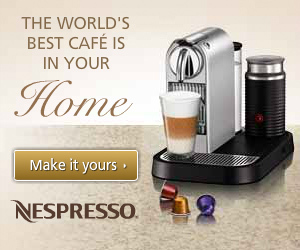 I thought it only right they be included in this review! You might notice the Dean's Seductive Strawberries lip balm tube is an oval shape as opposed to the others that are round. The round ones were from my second order, I don't know if this is a permanent change, but I hope not. I like the oval tubes much better, and the labels have a hard time sticking to the round ones. Also, the balm has a tendency to get stuck when you advance it in the tube, so careful not to twist it up too much, or it may get stuck that way. Bobby's Pineapple Delight - "Pineapple Bubblegum"
When you smell this one, you mostly get the pineapple, but once it's on the lips you can start to get the bubblegum flavor. Combined, it's a really interesting combination, one I wouldn't expect to be good, but is in a sweet and fruity way. Cas' Enochian Schnapps - "Watermelon Cinnamon"
Out of the tube, you can definitely smell the cinnamon, but with a hint of fruity sweetness lying underneath. This one does get a little tingly, so if you're sensitive to cinnamon, you may want to skip this one. Dean's Seductive Strawberries - "Chocolate Covered Strawberries"
This one is still my favorite I think, you can definitely smell and taste the strawberries, but with a hint of chocolate. It's not like overpowering, or overly fake chocolate strawberry, just a good quality flavoring. Impala Peach - "Mango Peach"
Incidentally, I have quite a few Coffin Kissers with a peach flavor, (well 2, does that count as a lot?) and this one you can definitely get the peach right upfront. And you can tell it's got something subtle mixed in, but without knowing, I couldn't pick it out and say that it's mango. Sam's Strawberry Mousse - "Strawberry Vanilla Creme"
I have the hardest time picking out the flavors in this one the most, it's just sweet smelling to me. Maybe a hint of vanilla? It's hard to tell, so this is probably my least favorite, just because it's another strawberry one and is a little redundant. Overall, I really like this collection, and not just because it tickles my Supernatural fandom bone (that sounded dirtier than I meant it, carry on). 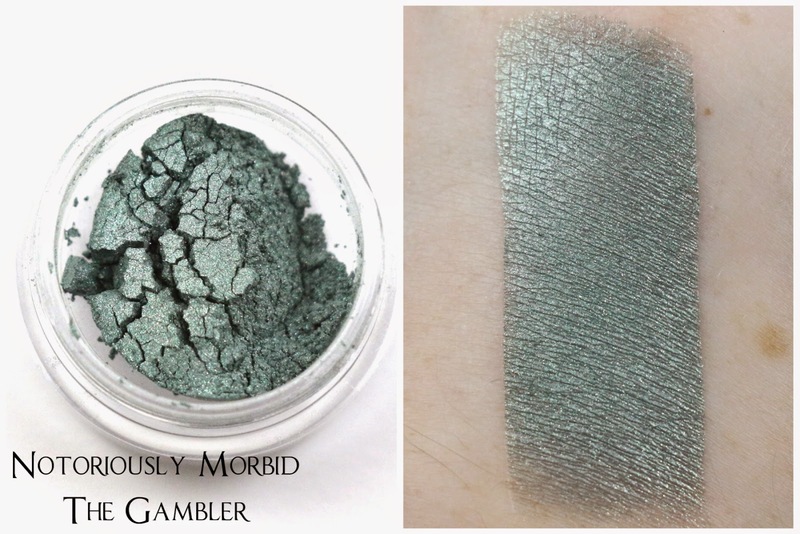 This was my first time really getting a chance to swatch a full regular collection from Notoriously Morbid and the shadows are an amazing texture combining light and airy, with dense and moldable. I think some of them actually do contain wax as part of the ingredients, but all of them had that texture. It adhered to my finger well, and smooshed in the jar very satisfactorily. There's really no other way to describe it except they feel like room temperature butter. And the nail polish was so opaque, I'd be interested in trying some of their other shades. And the Coffin Kissers are some of my favorite indie lip balms, so really I just highly recommend trying anything from Notoriously Morbid, especially this collection! Customer Service - For my first order I did not need to contact Carrie, but for my second which contained a Halloween specific item, I contacted her and asked if there was any chance I would get it by Halloween since I did not preorder it (The Grisly Grimoires set). She said she would do her best. It hadn't shipped by Halloween week, and I knew it would never make it, so I emailed again, and she said she would see if she could get it out that day. I did not receive tracking on it until October 30th, and it didn't get picked up by the post office until 5 days later. When it arrived, my invoice had a very nice note stating she was delayed more than anticipated due to running out of the lip balm tubes (which is why I don't know if the round tubes are a permanent change). I wish she just would have mentioned that, I wouldn't have minded waiting longer on the lip balms, but that's ok. She also included a $10 off my next order code for me as an apology for it not making it by Halloween. At first I was a little ticked off that it didn't get sent when she said it would, but the fact that Carrie tried to make it right when it arrived was very nice of her, and I appreciated the gesture. Availability - Notoriously Morbid doesn't really do many limited edition collections, except very rarely, so the entire Winchester Gospels collection is always available, as are the Coffin Kisser flavors. Overall Satisfaction - I love this collection, and my favorite shades/products were The Gambler, Visions, Walkin' On Sunshine, and the Dean's Seductive Strawberries Coffin Kisser. 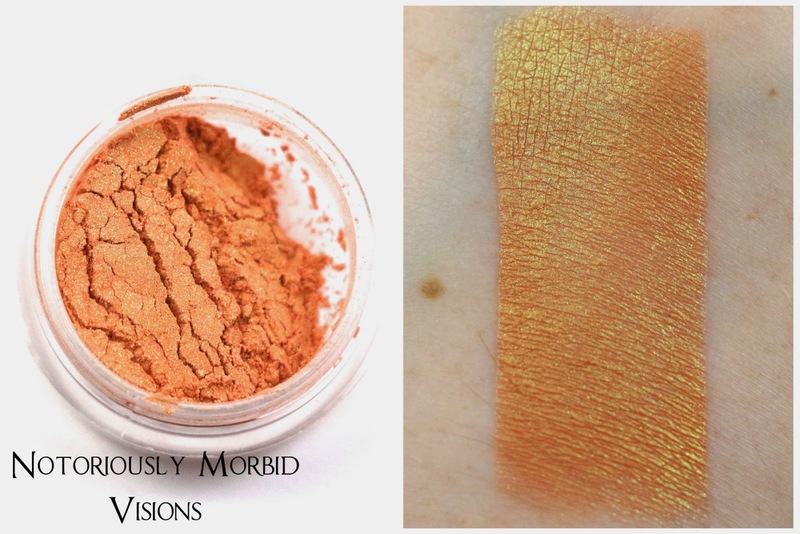 I will definitely be ordering from Notoriously Morbid again, as the shadows are buttery soft. Who's your favorite Supernatural character? What did you think of the Notoriously Morbid Winchester Gospels collection? Let me know in the comments! I'm not (yet?) a Supernatural fan, but have to say I LOVE this collection! Those Coffin Kissers sound absolutely divine too. 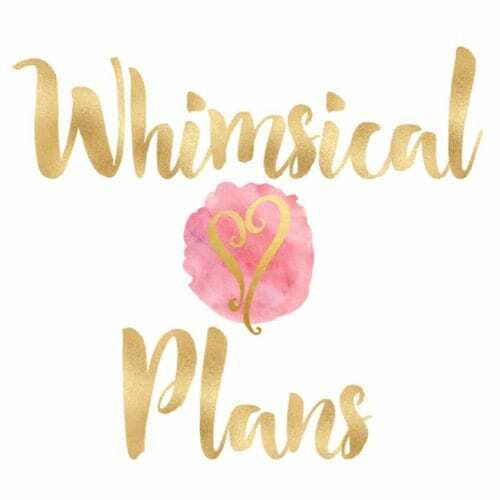 Well there's still time to become a fan! 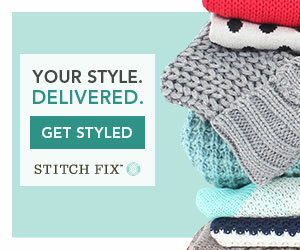 Why aren't you purchasing from or recommending them anymore? If you click that link there's a post I wrote explaining it.